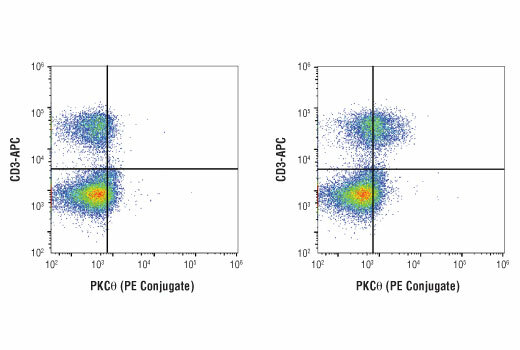 Flow cytometric analysis of mouse splenocytes using Rabbit (DA1E) mAb IgG XP® Isotype Control (PE Conjugate) #5742 (left) and PKCθ (E1I7Y) Rabbit mAb (PE Conjugate) (right). Splenocytes were co-stained with anti-CD3 conjugated to APC. PKCθ (E1I7Y) Rabbit mAb (PE Conjugate) recognizes endogenous levels of total PKCθ protein. Monoclonal antibody is produced by immunizing animals with a synthetic peptide corresponding to residues surrounding Pro632 of human PKCθ protein.